I decided to build the Walking Beast after seeing a video about the Ohio State University Adaptive Suspension Vehicle because it brought science out of the lab and into reality. I started thinking about battlebots, the MechWarrior video games, and a toy walking creature I had as a kid. It took me another ten years before I was re-inspired and decided it was time to build a walking machine. Then it was another three years to imagine, design, and build it and I spent over 6,000 hours cutting, notching, grinding, bending, welding and assembling the machine. 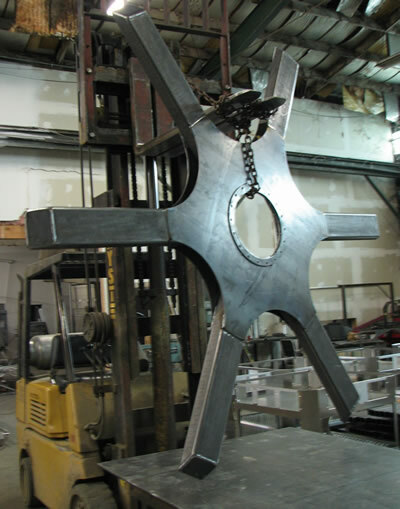 It helped that I am a metal fabricator and I had a shop where I could do this work. After The Walking Beast took its first steps in 2007, I had some help sanding, painting, and wiring. Later I had more help installing the LED lighting, upholstering the upper deck and repairing some mechanical parts. I enjoy bringing The Walking Beast out to events and festivals. It's fun to see kids and adults get excited about it. Who knows what other creations my work might inspire. The Walking Beast weighs more than most monster trucks! 6-bar linkage system designed and patented by Joe Klann for walking machines. The Walking Beast linkage has 56 pivot points and uses 114 bearings. 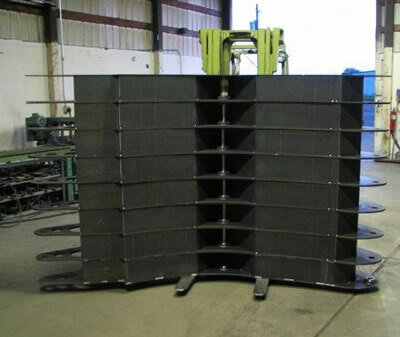 Frame, legs and linkage are tubing cut, notched and welded, or CNC plasma cut, and then formed on a press brake and welded together to form box or angle structures. All pivot points and pins are CNC machined. Speed Top speed unknown: machine has traveled briefly at 6 miles per hour. Typical cruising speed is 1-2 miles per hour. 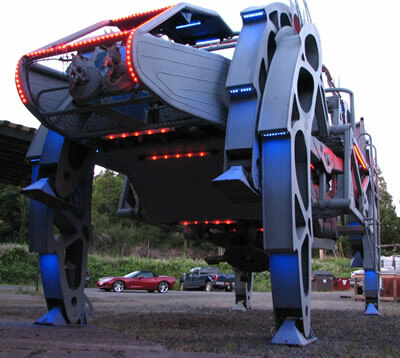 Fantasy vehicles like the Star Wars ATAT, MechWarrior video games and real-life robotics prototypes such as the Adaptive Suspension Vehicle (ASV) from Ohio State University inspired the creation of The Walking Beast. By now it is an iconic feature of the Burning Man arts festival and The Walking Beast has developed an international following of loyal fans. It is brought to public appearances by trailer and never fails to attract attention while on the road. 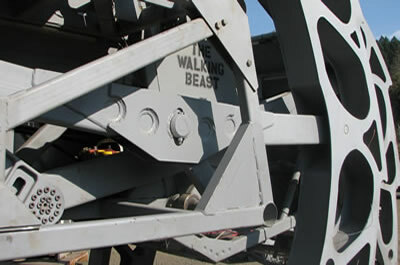 The Walking Beast started on the drawing board in December 2004 and walked for the first time in July 2007. Bringing the imagined creature to life meant making choices that reflected reality, such as determining the ultimate width of the machine to more easily accommodate road travel. Financial constraints and availability of parts and materials also affected design choices. A diesel engine was considered, but the 454 Chevrolet engine was ultimately selected because it was the most economical and available choice at the time. After 2 1/2 months of designing the monster it was time for construction. During this phase, The Walking Beast took approximately 6,000 hours of labor. This involved cutting plate steel using a CNC plasma table and bending the leg parts on a press brake in a process known as bump braking. Small bends were made every half inch on each leg to form a curved surface and then each leg was welded into a box structure. The frame was constructed using a combination of channel and rectangle steel tubing. Pivot points were machined from 1 solid stock 4140 steel. 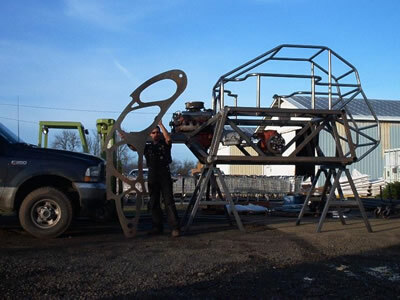 It took over one mile of welding to put together The Walking Beast. Legs were stacked to make welding easier. 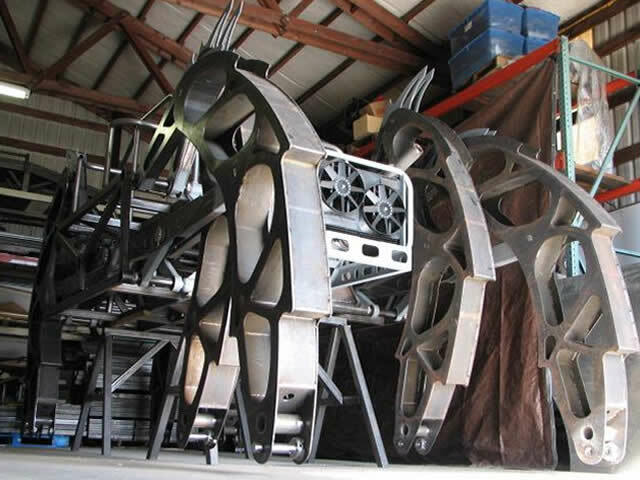 With only a month to spare before its first public appearance at Burning Man 2007, the frame was cut, extended, the motor moved back about 12inches and two planetary gear reduction boxes were coupled together and mounted in place in between the transmission and differential. 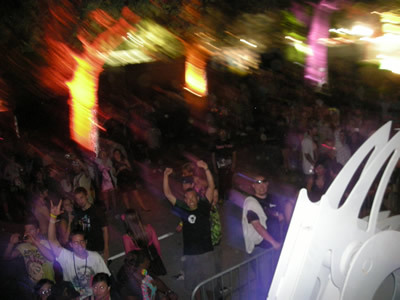 At the festival, the machine was walked only a short distance due to limited turning mobility. The legs were illuminated with custom built LED light assemblies. The leg crank shafts were replaced with custom machined parts to increase strength and allow for disassembly and maintenance. The differential was modified with a spool locker to lock the two axle shafts together. A hydraulic lifting arm with a steering disc was added beneath the frame to facilitate turning. 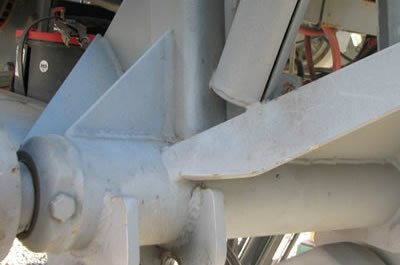 This arm lifted one side of the machine off the ground, allowing the other side to walk around the steering disc. This system added extreme stress to the axles and linkage, and after an appearance at the Denver Mile High music festival in June, the steering system was changed to a central lift system. The steering disc was redesigned to balance the machine and allow it to rotate 360 degrees. The differential housing was bored out to accommodate larger custom 2-inch diameter 5 ton axle shafts made from 4340 steel. The differential hubs and spool were also replaced to accept these shafts, which are heat-treated to have a tensile strength of 225,000 psi and are the same as those commonly used for monster trucks. The Beast walked about a mile in total at the Burning Man festival in August 2008. 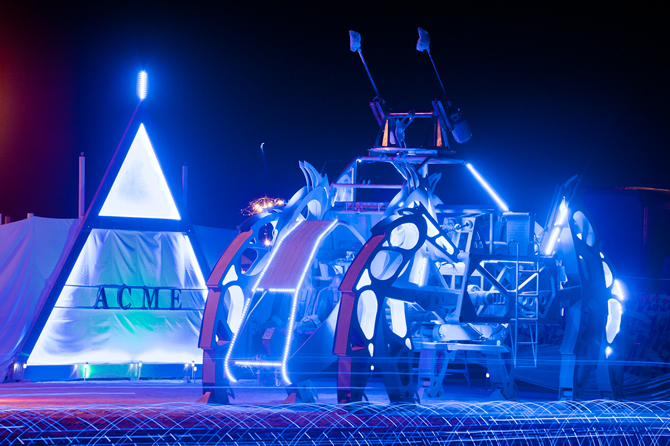 EL wire was added to improve night visibility while at Burning Man. Impact from the steps shook electrical connections on the machine loose and caused strain on bolts. The feet hit the ground with a lot of force and people said they could feel the ground shake from 500 feet away. 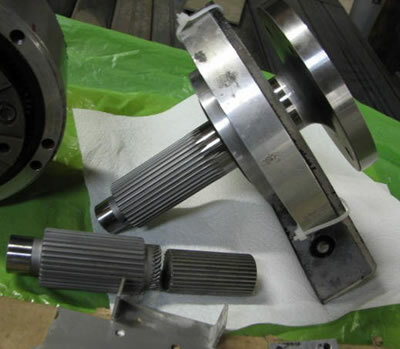 Cumulative stress caused the output shaft from the Klune-V extreme under drive gearbox to shear. The output shaft was redesigned, doubling its strength. The newly redesigned gearbox output shaft was replaced and 4,000lb-rated coil springs were added to the four front upper rocker arms to dampen the impact of the footsteps. These springs also helped to lift the legs for the next step, producing a much smoother ride for passengers and greatly reducing the amount of power required. Fuel mileage increased from 10 gallons per mile (GPM) to 6 GPM. Six extensions were added to the steering disc, improving stability by increasing the diameter from 17 inches to 44 inches. Engine sound levels were improved when original exhaust headers were upgraded to stainless steel headers with built-in mufflers. Aluminum body panels were added to the upper deck and seating was expanded to provide more room and comfort for passengers . EL wire was replaced with bright LED light strips along the cockpit and upper deck. 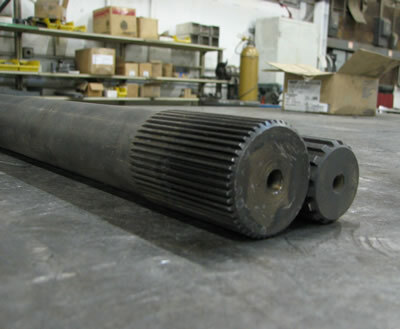 The gearbox output shaft was determined to be a weak link in the system so it was replaced with a larger shaft made of 8620 steel carburized (case-hardened) to 260,000 psi tensile strength. This has doubled the strength of the original output shaft, reducing need for replacement and enabling The Walking Beast to handle more uneven terrain. Decorative dew claws were added to prevent the feet from scraping the ground as they tilted forward. This improved the step action and reduced deep footprints in soft ground. The fantasy vision expanded with the addition of flame effects to the top deck. 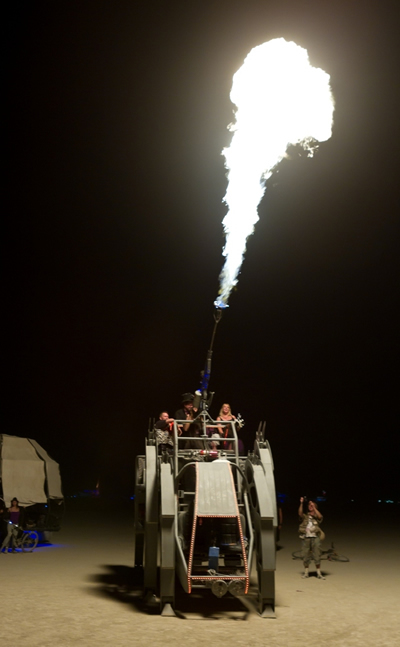 Two 100-lb propane cylinders behind the cockpit provide fuel for sending fire plumes and rolling fireballs 30 feet into the air. 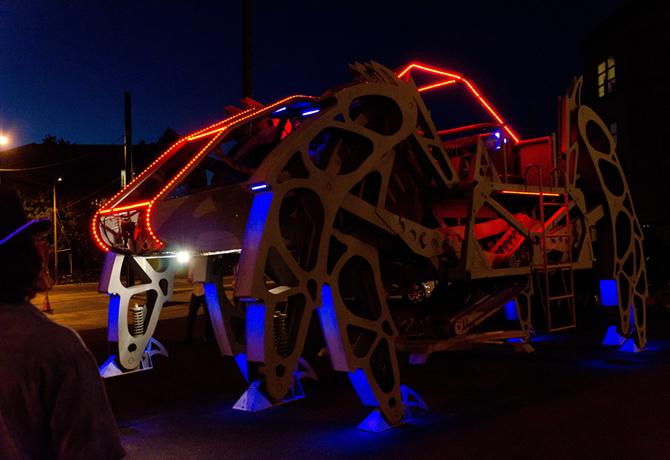 The hydraulic steering system was completely redesigned and rebuilt to improve steering functions and to allow The Walking Beast to lift itself on and off of the trailer used to transport it to events and festivals. Hydraulic cylinders on the lifting arm were replaced with larger cylinders to increase lifting force and the previously extended 44 inch steering disc was replaced with a stronger 96 inch disc. Four 3,000lb-rated coil springs were added to the original coil springs to further reduce stress on the machine, provide a smoother ride for passengers and to improve fuel efficiency from 6 gallons per mile (GPM) to 2 GPM. The original 50-gallon fuel tank was removed and replaced with a 20-gallon tank to reduce weight and wasted fuel. At just over 3 years of active life, The Walking Beast began to show signs of wear and stress from operation. 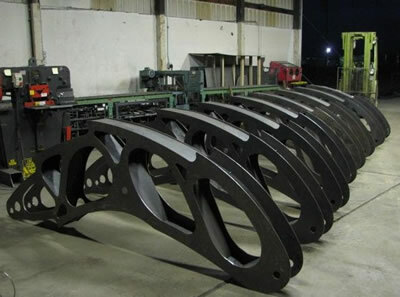 Sixteen 3/8-inch steel plates were added to reinforce each side of the eight main arms and additional steel gussets were added to rigidify the main frame. There were no significant mechanical additions to The Walking Beast this year, but it received a new paint job and routine maintenance. New LED lights in subtle blue tones were added to highlight the sides and legs at night. 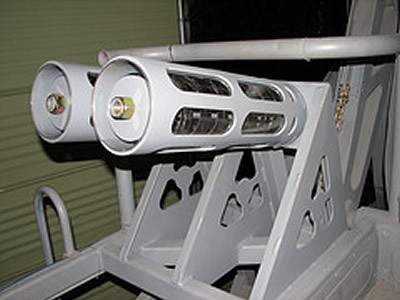 Up top, a double barrel flame cannon was mounted on a 48 turret system that provides a 360 degree range of fire. Bright LED lighting illuminates The Walking Beast at Burning Man 2012.